Okay, so you fans of my blog Hollywood2020.blogs.com know already that Coachella is a favorite post of mine and yours...so how could I NOT cover the 'lost and found' story of the Coachella pig this week, blogged by Joyce [email protected]. Click on thumbnail to see the 'release' of the pig at the concert. Click on thumbnail to see pix of THE PIG on Youtube.com -- nope you have to go find him/her yourself No link. Click on thumbnail and you can almost see the giant pig -- at LAist.com -- miss the whole story -- well, lets just say the wolf did not blow the house down! BUt PIGS DO FLY -- especially at Coachella! js. In a press release posted on PR Web by Market America inc, they announce the upcoming launch of a new entertainment portal and social networking site blogged by Joyce Schwarz, JCOM, www.joycecom.com, business development and emeging media consultant. James (JR) Ridinger, president and CEO of Market America, Inc. announced new entertainment portal and social networking at recent confab. Here's the quote from James (JR) Ridinger, president and CEO of Market America, Inc. featured in that release we found most interesting: "We are very excited to welcome over 23,000 of our Distributors to Miami to learn about the latest products and services Market America will be unveiling in the next few months," said James Ridinger. "In addition to all the new products we'll be launching; we also have some major news to share about our partnership with Google and celebrities like Kimora Lee Simmons as well as the launch of the entertainment portal and social networking site on marketamerica.com." (Blogger note -- we put that last sentence in blue for emphasis". Could they outsell Amazon.com or what about LiveNation? According to one unidentified source, Hollywood2020.blogs.com talked to who attended the Market America Leadership Conference last week, there was talk that the new Market America entertainment portal could "OUTSELL" Amazon.com for music...amazing huh? Think about 160,000 reps...hmm LiveNation.com heads up too!!!!!!!!! According to their standard blurbage they hae 2000 partner stors and have generated more than $2.4 billion in accumulated retail sales. According to the release, the entertainment portal is scheduled to go live on marketamerica.com in March but Market America executives will specify at Leadership School what Distributors, customers and fans of top artists can expect from the launch. Blogger note the Market America Leadership school just wrapped in Florida last week. "Through the partnerships we are forming with top artists in the music industry, the entertainment portal will be the ultimate destination for fans to purchase CD's and products associated with their favorite artists, buy concert tickets for upcoming shows, download music, and will be a platform for interaction between fans and their favorite artists," said James Ridinger. Market America's social networking site according to James Ridinger will provide a platform for distributors, customers, friends, and virtually anybody, to chat and connect with friends and will offer many of the same functions as Facebook and MySpace. Additional features will include displaying virtual rooms to profile pages allowing a user to display their lifestyle and customize their experience. Market America is a product brokerage and Internet marketing company that specializes in One-One-Marketing. Blogger note -- bold face is ours: With more than three million customers and 160,000 Distributors worldwide, the company has generated over $2.4 billion in accumulated retail sales. Headquartered in Greensboro, NC - the company was founded by James Ridinger in 1992 and employs over 500 people globally with international operations in the United States, Canada, Taiwan, Hong Kong and Australia. Through its revolutionary One-to-One Marketing concept, Market America combines the Internet with the power of people - creating the ultimate online shopping destination. More information is available at www.marketamerica.com. Okay, okay I know I'm compulsive but after writing this Woody Guthrie recording restoration story I had to see what Magnetic Wire really was/is...and I found the info on Wikipedia.com of course-- here's an excerpt...Wire recording is a type of analogue audio storage in which the recording is made onto thin steel or stainless steel wire. 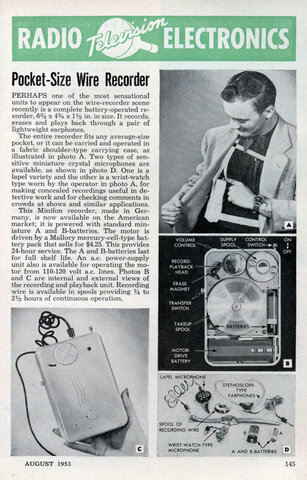 Wire recording's most widespread use was in the 1940s and early 1950s, following the development of inexpensive designs licensed internationally by the Brush Development Company of Cleveland, Ohio and the Armour Research Foundation of the Armour Institute of Technology (later Illinois Institute of Technology). These two organizations licensed dozens of manufacturers in the U.S., Japan, and Europe. Here's the wikipedia reference to the Woody Guthrie recording: In 1949 at Fuld Hall in Rutgers University, Paul Braverman made a 75-minute recording of a Woody Guthrie concert using a wire recorder. The recording only came to light in 2001, and appears to be the only surviving live recording of Woody Guthrie; it was restored over several years and released on CD in 2007. The CD was subsequently nominated for and won a 2008 Grammy award. webster wire recorder sample -- from Chicago-- similar to the one that had the Woody Guthrie song on it ...that later earned the Grammy for restoration! A blurb on tonight's slashdot.com spots the Grammy award given blogged by Joyce Schwarz @www.hollywood2020.blogs.com to University of New Hampshire's Dr. Kevin Short for the restoration of what may be the first Woody Guthrie live performance to be saved. UNH's Dr. Kevin Short won Grammy award for restoration of Woody Guthrie performance. Hollywood2020.blogs.com blogger Joyce Schwarz missed this event when it was in NYC a few years ago-- but it's worthwhile to bring it up again...fascinating look at past and present. "I was fortunate enuf to see Frank Sinatra in person twice-- once in Vegas and once at a benefit at Carnegie Hall...the latter was the best-- I was in the 5th row and all these dudes in Tuxedos were standing on their chairs yelling -- for ONE MORE TIME FRANKIE....wow....amazing...js. FOUND -- if you missed it you must see it, blogged by Joyce Schwarz @ Hollywood2020.blogs.com -- Alicia Keys opens the Grammys with a virtual duet with Frank Sinatra...we located the video here...Here are some pix we took from the popcrunch.com video -- thanks popcrunch...even the live bloggers didn't have pix-- silly to live blog Grammys with no pix isn't it?? js. Video of Alicia Keys' musical tribute to Frank Sinatra-2008 Grammy Awards. As many of your faithful readers know, I was presenting at Digital Hollywood, Spring 07 last week...blogged by Joyce Schwarz, www.hollywood2020.blogs.com. What I didn't tell you was this tale about the blank CD that happened when I stopped at a major chain drugstore on my way home from the conference one night. He asks -- what aisle are they in...and she says -- over there in aisle 3 -- by the office supplies...paper, ink etc. And he heads over to Aisle 3 -- and he echoes back Aisle 3 right..still sounding clueless to me. What a generation of screenagers we live with ! AMAZING......wonder if the RIAA knows what's on his computer at home???????? INTERVIEW WITH MARC CUBAS, CEO, MUSICPLUSTV.com a few months ago, Hollywood2020.blogs.com blogger Joyce Schwarz was invited over to MusicPlusTV.com's offices to meet with CEO Marc Cubas and to see the amazing facility. At that time I took some pix now included here and met some of the other execs and 25 totally awesome and creative staff members. Today, I see that my pal and colleague Editor of Socaltech.com, Ben Kuo has an excellent Q&A with Marc. So I'm, with his permission .excerpting the first few graphs of his interview and linking to the rest of his lengthy story. Thanks Ben. I've added to the interview some pix I took over at the MusicPlusTV offices ENJOY. One of the best quotes that Marc gave me when I talked with him was when I asked what kind of music they focused on -- he smiled one of his great smiles (you must meet this guy -- he's well, amazing!) and he said "GREAT MUSIC" ....check out the new design and format at www.musicplustv.com. And thanks Marc for agreeing to be one of the featured venues for my client SilverLake Film Festival which is set for May 3-12 in several different locations in yes, SilverLake, Hollywood, Echo Park and other areas of Los Angeles. (www.musicplustv.com), a Los Angeles firm that develops live programming for the Internet. MusicPlusTV provides live streaming of music and bands, along with archived video content. The firm has received venture funding from Kenai Investment, along with significant funding from Cubas himself. Ben Kuo spoke with Marc. Marc Cubas: Music Plus Television Network is a new media company. How we've been operating for the last three and a half years is basically broadcasting live programming globally. We also... (continued...) Blogger note-- here's the link to the full story. Enjoy the pix below also Joyce Schwarz took them on location at www.musicplustv.com's offices! INSIDE THE MUSICPLUSTV.com studios via pix from blogger Joyce Schwarz, www.hollywood2020.blogs.com. LIVE PROGRAMMING ...every day at MusicPlusTV -- check out the schedule at www.musicplustv.com. When blogger Joyce Schwarz visited the studios she was amazed at the quality of the programming, the production values and just how this studio and network seem to reflect the true tune of the next-generation of Music2.0 & beyond. MusicPlusTV(www.musicplustv.com) facilities are top notch....and the diversity of the staff and crew fits the 20th century vision of how the workplace should be...from tattoos on smiling surfer types to Mohawks on multi-racial and multi-generational staffers and crew and hosts. Kudos for Marc Cubs for creating the next-gen in Music! MTV & HARMONIX --MAKING MUSIC & GAMES TOGETHER....VIRTUAL IDOLS? IT's never too late to make that dream of being a rockstar come true...at least in the virtual world at least, and now thanks to the new MTV/Harmonix deal you can pick your choice of instrument and more than likely how you want to look forever in your own group, blogged by Joyce [email protected]. WHAT MORE CAN WE SAY....Guitar Hero....coulda, shoulda...we've been telling them for almost a year...what can we say? Last year at the Austin Games Conference we told you about how big the MTV games booth was and how excited they were about the future of gaming...and some of their own games. And we've been big Harmonix fans for a long time. And well...Guitar Hero....a guitar beats a mouse anyday! With 25-38 million viewers weekly, there's no doubt that America is hero crazy or should we say IDOL crazy...but still it seems that MTV is launching their band video game before a 'singing game'...but who knows what's really in store. We haven't even had a chance to review all of these articles. Take a look. And yes-- we will use this as another chance to show our pix on stage at the LA Games Conference playing Guitar Hero! In the northern Iraqi town of Irbil, thousands packed into a shopping mall courtyard and stood before a massive screen, shouting for the victory of their candidate: "Shada! Shada!" Sunnis and Shiites will unite with your victory!" read one text message, sent by a viewer, that scrolled across the screen Friday during a pre-show on Iraq's al-Sharqiya satellite channel. "You are the one who unites all of Iraq, from North to South, from the Tigris to the Euphrates!"